Will Chase Anderson help Milwaukee to a crucial win over Chicago? As the Boston Red Sox become the first team to clinch a playoff spot Ben Steele returns from holiday to break down the key MLB matches as the race to play in October continues. "Hader struck out all six batters he faced and 11 of the 24 pitches he threw were swung at but missed an incredible effort that will make him a crucial part of any Brewers playoff appearance." The deciding game between the Cleveland Indians and the Tampa Bay Rays looks set to be a real pitcher's duel. Cleveland's Carlos Carrasco comes in to the game with a 16-8 record and a post All-Star break ERA of just 2.31 and he's not even the hottest pitcher in tonight's game. Blake Snell (18-5) has won six straight matches and has allowed 2 runs or fewer in 14 consecutive starts at Tropicana Field. Snell, a key member of a surging Tampa team who have lost just three of their last 20 matches, will have to keep Jose Ramirez quiet if he's going to continue his streak tonight. Ramirez is having a career year, hitting 37 home runs and stealing 32 bases giving himself a chance of becoming just the fifth player in MLB history to join the 40-40 club. I expect Snell to win the matchup with Ramirez and collect the 19th win of his season but the game will be low scoring as a pair of aces face off. The Giants are currently on their worst losing streak since moving to San Francisco in 1958 and, having already lost the current series with the playoff chasing Atlanta Braves, I expect them to suffer their 11th straight defeat. The big concern for San Francisco will be that they could very well go behind early; with Venezuelan sensation Ronald Acuna Jr leading off and All-Star Freddie Freeman in the clean-up spot the Braves have one of the best offences in the league, and have made scoring runs early a habit. Acuna Jr has hit 18 home runs in the last two months often putting the Braves into the lead after just a single inning, with the Giants in terrible form look for the Rookie of the Year candidate to shine again and leave the home crowd disappointed as a San Francisco season that looked promising at times continues to peter out. The National League playoff race is extraordinarily close this season, with eight teams competing for five spots, there is a chance that three of those spots could be taken by teams from the NL Central. As a result, tonight matchup with the division leading Chicago Cubs is crucial for the Milwaukee Brewers. Fortunately, their starter Chase Anderson has a very positive record when facing two key Cubs hitters and bullpen star Josh Hader has flashed the ability to dominate the heart of the Chicago lineup. Javy Baez and Anthony Rizzo are key members of the Cubs batting lineup but neither of them have ever contributed a run when facing Anderson; in fact, only Ben Zobrist can say he has had consistent success against the 30-year-old Texan. 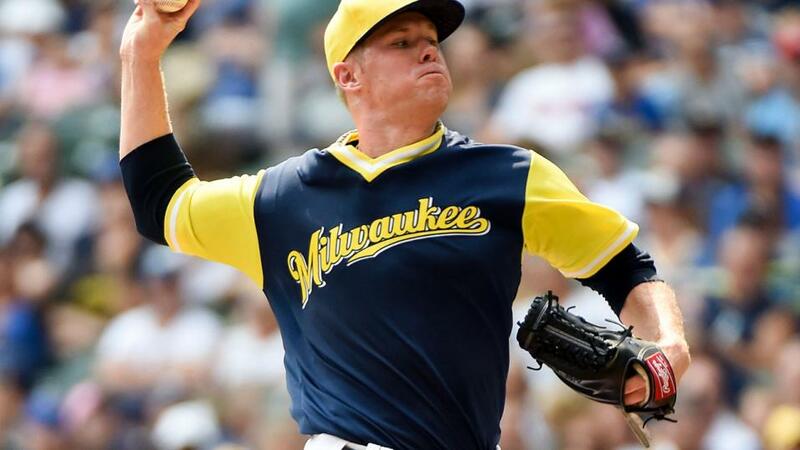 If the Cubs do manage to get past Anderson the Brewers will no doubt turn to Hader, an All-Star reliever who produced an amazing display in his last appearance on Monday. Hader struck out all six batters he faced and 11 of the 24 pitches he threw were swung at but missed an incredible effort that will make him a crucial part of any Brewers playoff appearance. The game should be low scoring, but Anderson's record and Hader's dominance makes the Brewers good value at 27/20.